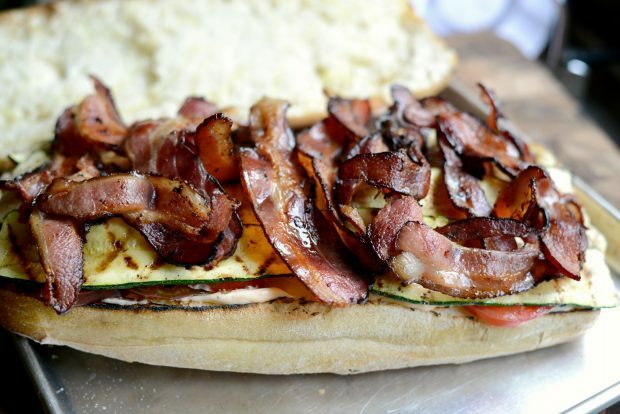 Grilled BZMT Sandwich is loaded with bacon, zucchini, mozzarella and tomato! Finished with a sriracha garlic aioli. 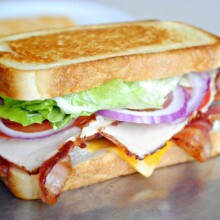 Best grilled sandwich ever!! 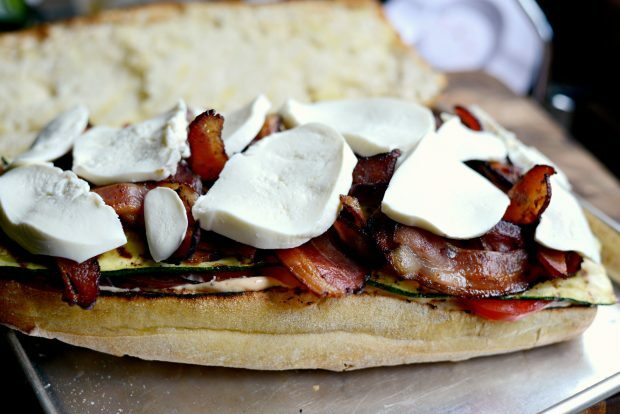 As in (crispy, thick-cut) bacon and fresh basil (they’re sharing the B)… as in (grilled) zucchini, fresh mozzarella cheese and (heirloom) tomatoes. <—-this is sandwiched in between grilled ciabatta bread that is slathered with a spicy Sriracha aioli; making this one big mamma-jamma of a sandwich. High Five. I woke up at freakishly early yesterday morning, grabbed a cup of coffee and headed to the grocery store for some basic grocery necessities- i.e. 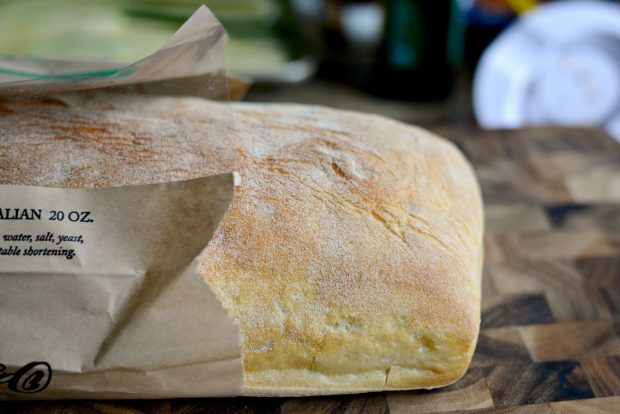 butter- and then headed to my favorite local market for things like applewood bacon, heirloom tomatoes, fresh basil and a big-o loaf of ciabatta. Not really thinking much of it I put these gorgeous colorful tomatoes in one of those produce bags and finished grabbing the things I needed. When I checked out and the cashier rang up the tomatoes and I about had a myocardial infarction and dropped dead on the spot. Eight dollars for five heirloom tomatoes would have been my initial guess, 10 dollars tops. My heart (and bank account) was not expecting $12.96. FOR FIVE TOMATOES!! They’re lucky that they are so pretty and tasty. Ps. the tomatoes cost more than the pound of applewood bacon. Ridic. 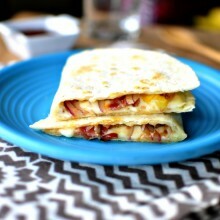 Now let’s talk about how I get my kids to eat the recipes/food I test. I use the good and foolproof method called bribery. Let me just preface this by saying that my girls are (almost) 12 and 15… so I fully admit to them that this is my tactic and they fall for it every single time. How do I bribe them, you ask? Well I take my oldest daughter’s cell phone and then threaten to post a snapchat to her story of a picture of her with the hippo or the side mouth filter (or any unflattering filter) and if she was to try it and take a bite I will simply give her back. Done. Now for my youngest, I just bribe her with a sip of whatever I’m drinking i.e. sparkling lemonade, coffee, whatever… and with that, it’s pretty much in the bag. Ps. They LOVE this sammich. PPS. My daughters may be more mature than I am. Obviously I sliced up way to many tomatoes. Hey that’s okay, I took the ones I didn’t use and placed them into a ziplock baggie and will use them for sandwiches this weekend. Because these million dollar tomatoes will not go to waste. Arrange the tomato slices on paper towel so some of the liquids can be absorbed, then set off to the side. Slice up 1 to 2 zucchini’s, drizzle with olive oil, place onto a large rimmed sheet pan or platter and season with salt and pepper. Grill zucchini slices over medium heat for about 4 to 5 minutes (flipping halfway) until tender and with good grill marks. 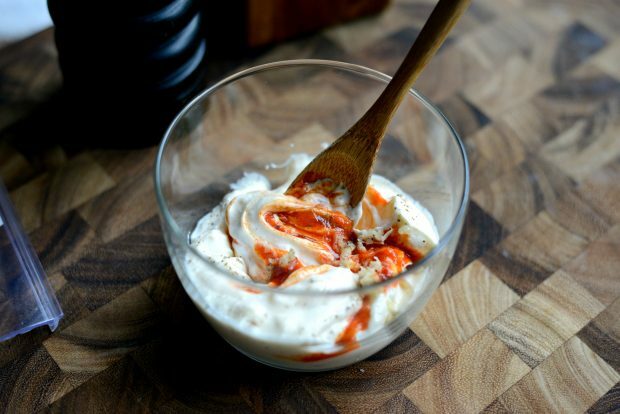 Mean while whip up the super simple Sriracha garlic mayo: add 1/2 cup of mayo, 1 teaspoon (or more!) Sriracha, 1 small garlic clove (grated) and a 1/4 teaspoon freshly ground black pepper. Stir, cover and refrigerate until ready to use. 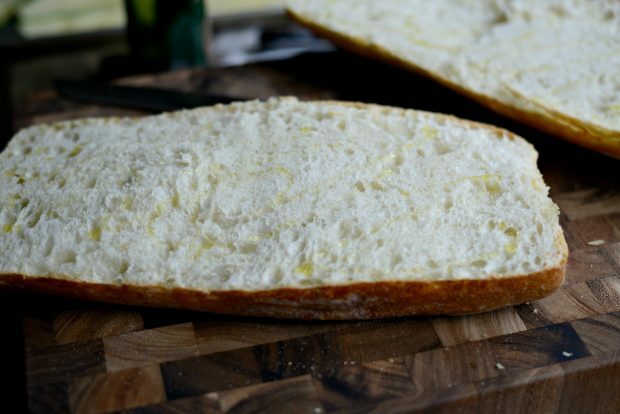 Cut a 20 ounce loaf of ciabatta in half and lightly drizzle it with olive oil. Place the bread (cut side down) on the grill grates and grill for 2 to 3 minutes or until toasted. Do not grill the other side yet. 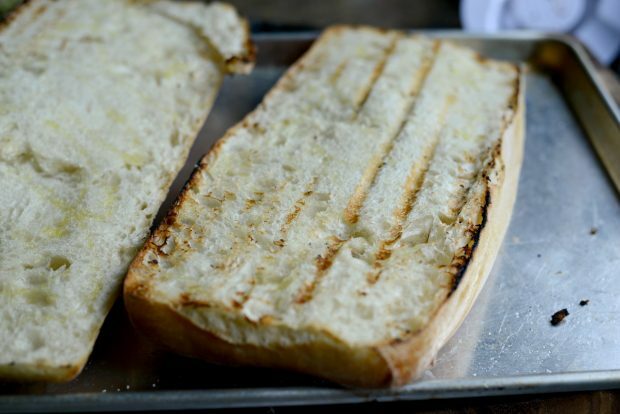 Transfer the grilled bread to the rimmed sheet pan. …and smear it all around. 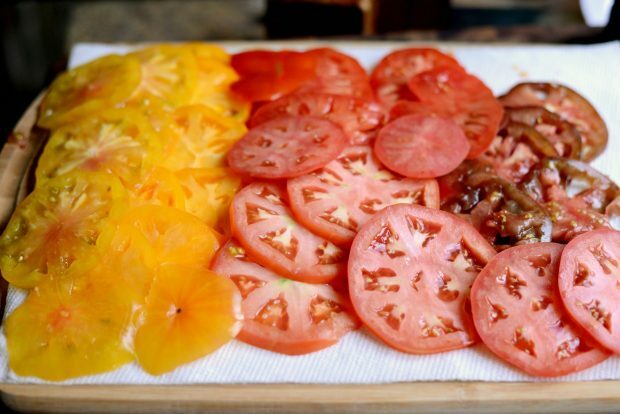 Arrange the tomatoes to cover the entire surface and season with kosher salt and black pepper. And place onto the grill grates. 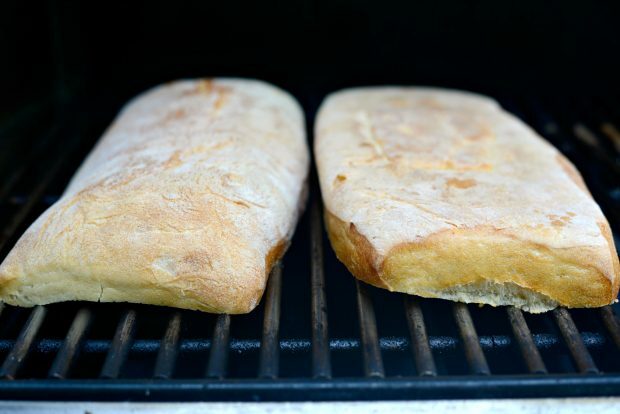 Reduce the heat under the bread to low, but keep the opposite (unused) side of the grill on medium-high heat. Close the lid and allow the cheese to soften and start to melt. Leave the bread on as long as you like, as long as the bottom does not burn. I prefer my mozz warmed and just starting to melt. 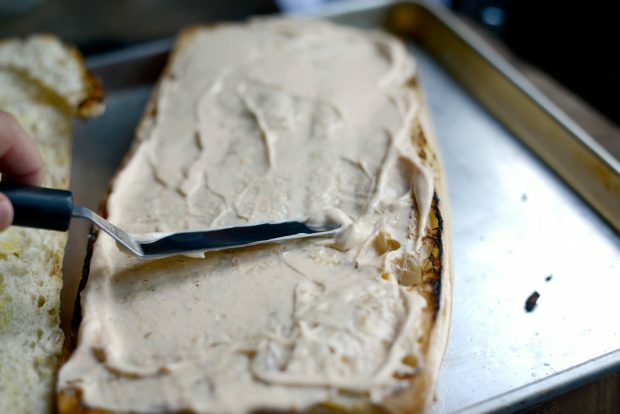 …before replacing the top side of the loaf. Lastly, cut the sandwiches into portions. 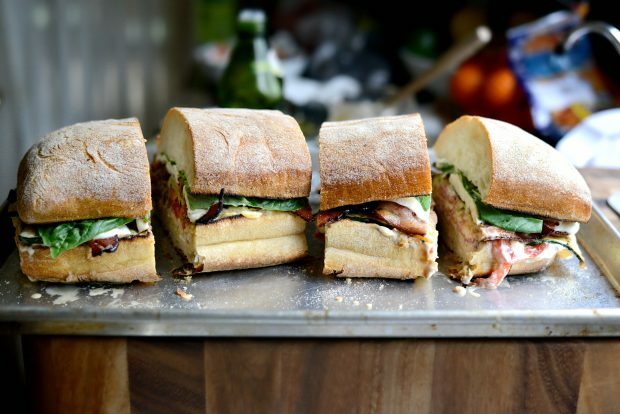 The serving size will depend on the size you cut them, but roughly 4 large sandwiches or 8 small. 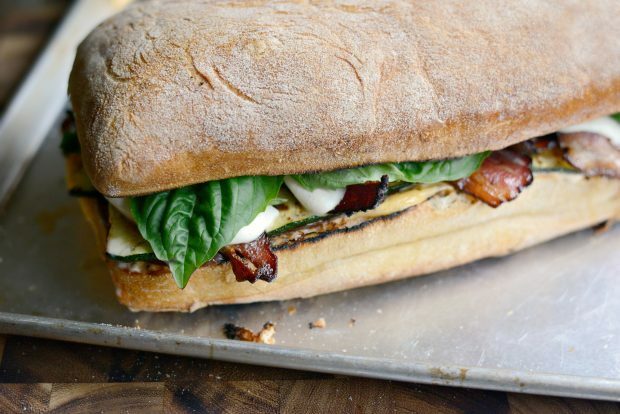 And then serve this amazing grilled BZMT sandwich! 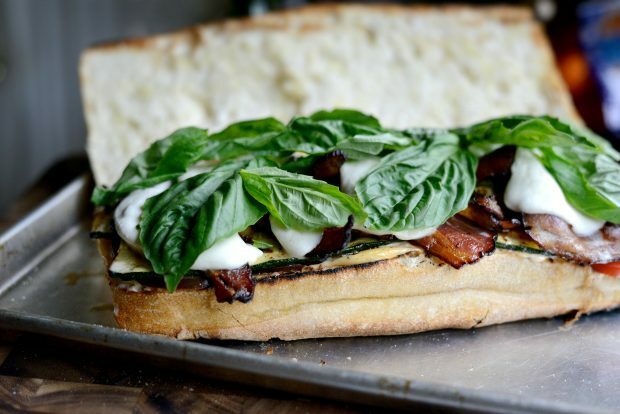 As in (crispy, thick-cut) bacon and fresh basil (they're sharing the B)... as in (grilled) zucchini, fresh mozzarella cheese and (heirloom) tomatoes. 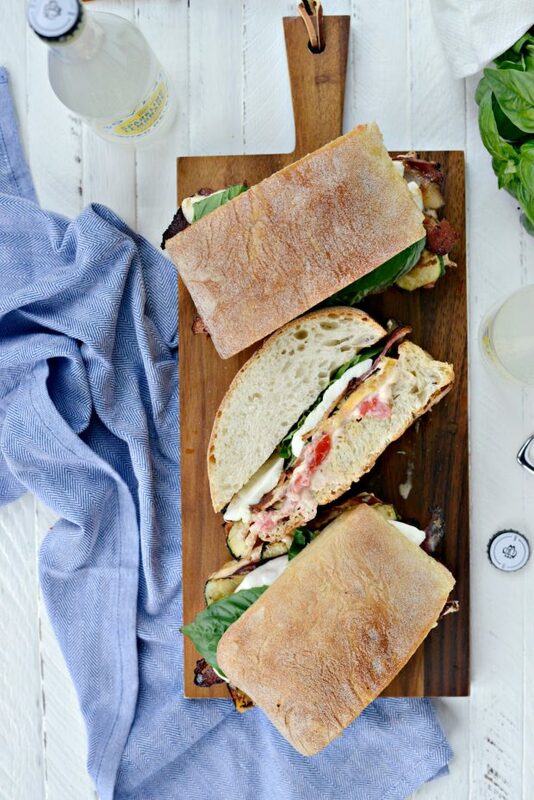 <----this is sandwiched in between grilled ciabatta bread that is slathered with a spicy Sriracha aioli; making this one big mamajamma of a sandwich. High Five. Work in batches, cooking the bacon in a large skillet until crispy. Drain on a paper towel lined plate. 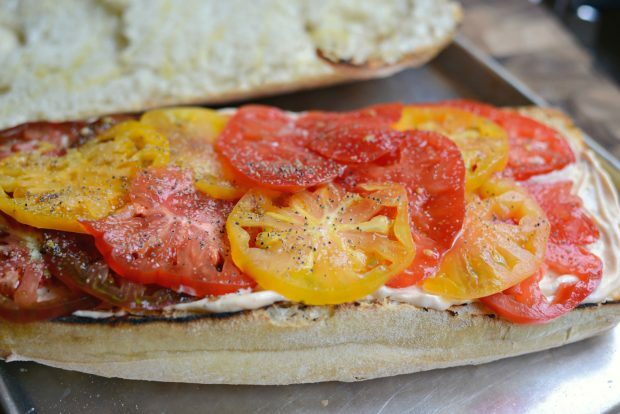 Meanwhile arrange the tomato slices on paper towel to absorb some of their liquids. Next toss zucchini in 2 teaspoons olive oil, or more if needed until both sides are coated. Arrange the zucchini on a rimmed baking sheet and season with salt and pepper. Lightly drizzle the cut side of the bread with olive oil and place both haves on a rimmed baking sheet as well. 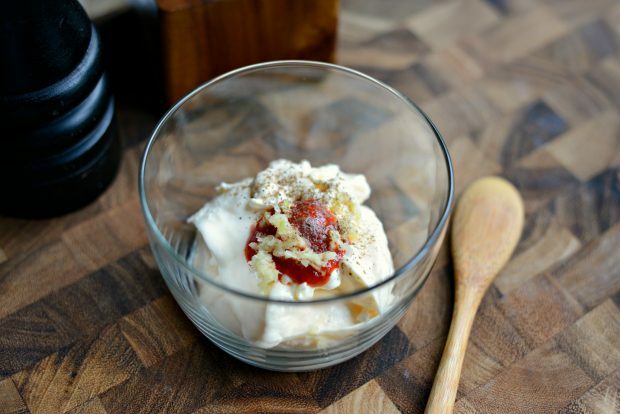 Prepare the aioli by combining the mayo, sriracha, garlic and pepper. Stir to combine, cover tightly and refrigerate until ready to use. 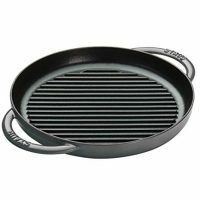 Preheat your outdoor grill or grill pan to medium heat (about 300 to 350 degrees). 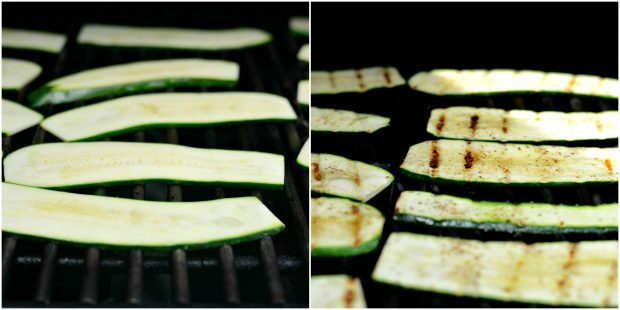 Grill the zucchini slices for 3 to 4 minutes per side or until tender yet still firm and with good grill marks. 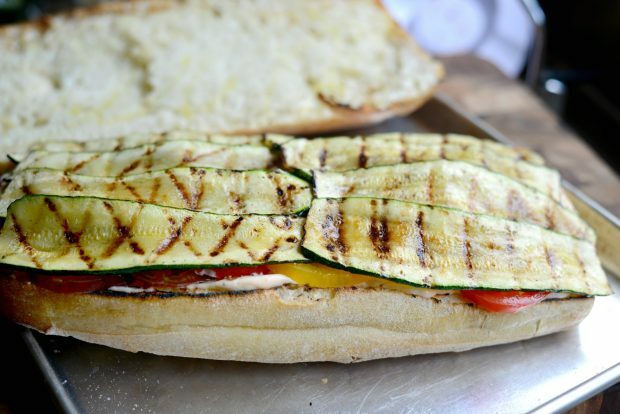 Transfer the grilled zucchini back to the baking sheet. Place the bread, cut-side down on to the grill. Grill for 3 to 4 minutes or until grill marks appear and the bread is toasted. Remove the bread to the sheet pan. 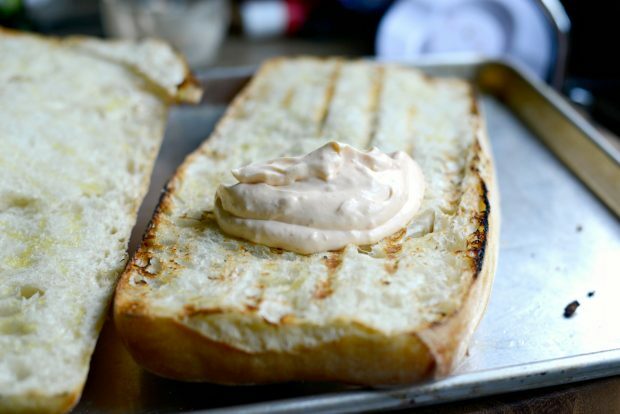 Spread a desired amount of the sriracha aioli on to the (cut side) grilled bottom half of the loaf. 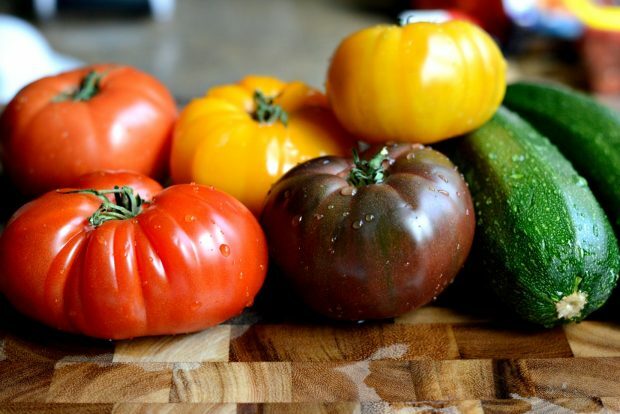 Arrange the tomatoes and season with salt and pepper. 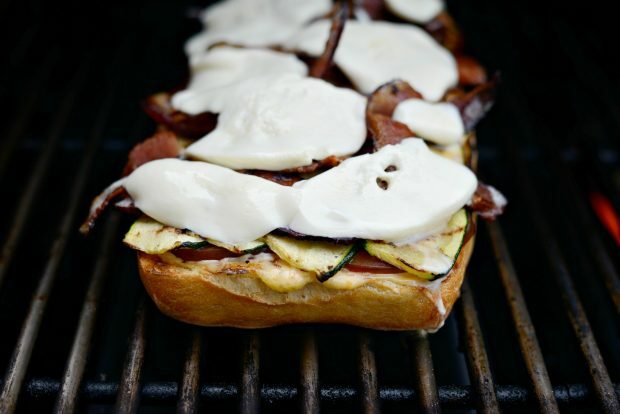 Arrange the grille zucchini over top, then the bacon and lastly the slices of mozzarella. 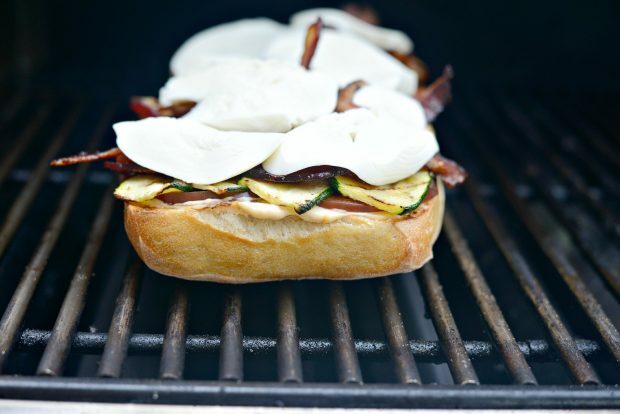 Place the half of the loaf with the toppings on to the grill. 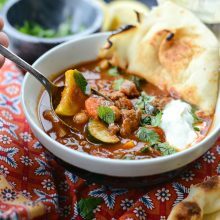 Reduce the heat on that side to medium low (about 200-250 degrees) and increase the unused side of the grill to medium high. Close the lid and allow the mozzarella to soften and start to melt. 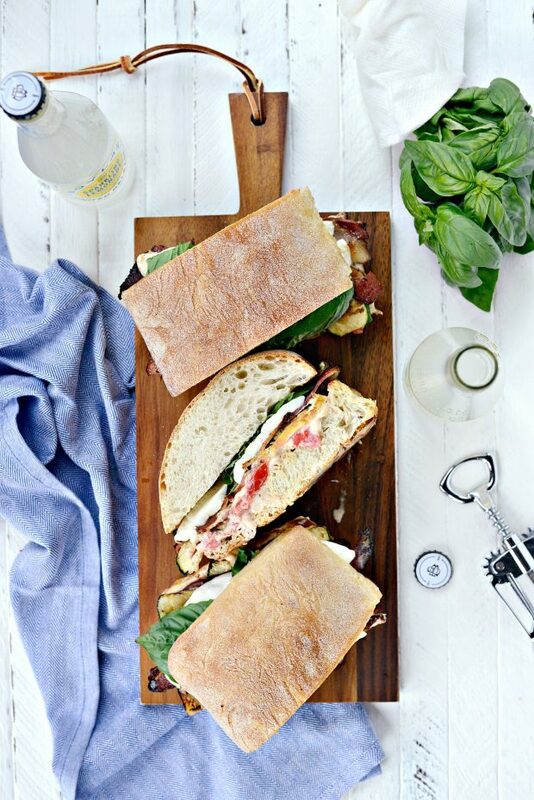 Transfer the bottom of the sandwich to the rimmed baking sheet and top with fresh basil leaves. 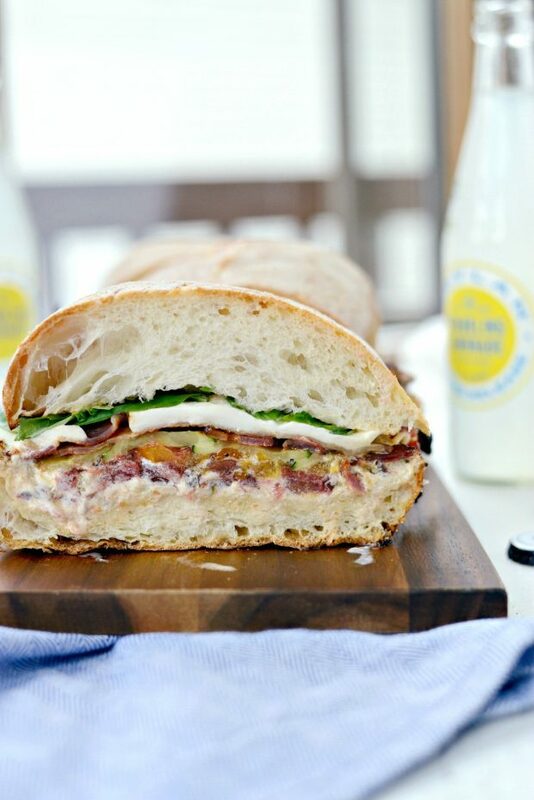 Replace the top portion of the sandwich, cut and serve. That looks so good. 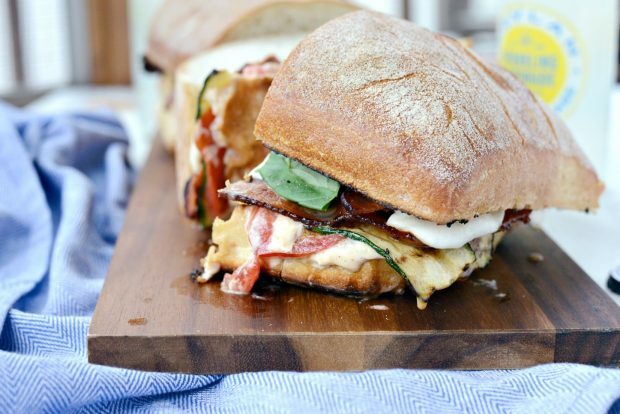 I’ve never missed gluten and dairy as much as I do looking at this sandwich! !